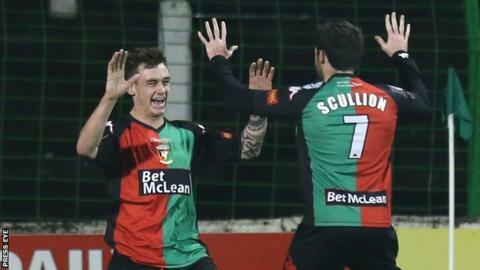 A hat-trick from Glentoran new boy Chris Lavery at the Oval helped the Irish Cup holders book a home sixth round tie with Glenavon on 6 February. Jay Magee was also on target in a 4-1 win over Ards, Denver Gage finding the net for the Championship One leaders. Championship One side Knockbreda beat Annagh United 5-1 at Tandragee Road, with Dylan Wilson (2), Owain Beggs (2) and Matthew Johnston their scorers. Scott McCordick had given Annagh an early lead with a curling free-kick. Wilson grabbed his first from inside the box in the 16th minute, Johnston struck from 12 yards out to make it 2-1 on 36 and four minutes later Wilson got on the scoresheet again. Beggs scored in the 61st and 77th minutes to secure Knockbreda, who had former Glentoran striker Michael Halliday in goal, an away tie against Lurgan Celtic in round six. At the Oval, Lavery followed up to score on 19 minutes after a Steven McCullough thunderbolt had been palmed out by visiting goalkeeper Ryan Brown. A neat low left-foot finish into the bottom corner saw Lavery add his second after 25, then Fra McCaffrey had his effort tipped over by Brown. Former Ballymena defender Gage pulled one back for the League Cup finalists a minute from the interval, courtesy of a close range header from a David McAllister corner. Magee headed home from Lavery's corner one minute after the break, before Lavery passed up a succession of chances to add to his tally. The ex-Lurgan Celtic player blasted over the bar twice and hit a post, before finally completing his treble by drilling home in the dying moments. The result will come as a major boost for Oval boss Alan Kernaghan, following a run of three consecutive league defeats. Meanwhile in the Mid Ulster Cup semi-final at Stangmore Park, Dermot McCaffrey, Matt Hazley and Jamie Douglas scored in Dungannon Swifts' 3-2 victory over Glenavon. Matt Lynch and Declan O'Brien were the scorers for the Lurgan Blues.